Last night was pretty bad. The room was cheap, there was a heater in the room, but the bed was absolutely awful. I could feel the springs in the mattress poking me, and it was impossible to get comfortable. I slept, but not very well. I woke up with my hip hurting and I felt like I was limping as I started walking. I walked out of my room at 7 to go to the bathroom, and ran into Alex and Lena on their way out the door. I wished them a buen camino, and Alex said, “buen camino,” then chanted, with a fist pump, “Pa-ra-dor!” So funny. Yup, I’m excited. I got “breakfast” at the bar, which was a packaged croissant and colacao. I was out the door by 7:50, and there was some lovely fog. The most unusual thing, though, was that there was no wind. No wind and no rain! As the sun started to come up it got quite warm. I stopped in the next town to take my jacket off. There was a little park area with benches, so I headed over there to take my pack off. To get there, I had to step over a concrete ditch. It looked perfectly normal to me, but the surface was covered in moss and lichens, which made it extremely slippery. I went down, on my bum, hip, and back. As far as falls go, I’m sure it was a fairly gentle one, but it was still a fall. I wasn’t hurt, but I was worried about potentially pulled muscles. I’m afraid I will feel it in the morning. I took some ibuprofen. My skirt and bag have some nice bright green mossy stains. I walked to the next town and decided to get a second breakfast. This town was Moratinos, aka “Hobbiton”. At least, it totally looks like it. There’s even a sign by the hill saying that it’s not Hobbiton! I was impressed. I also found Estelle! I had been wondering about her just the day or two before, wondering if she was somewhere behind me. I didn’t think she would be ahead! She sat with me while I had breakfast and walked with me to Sahagun. This albergue in Moratinos is hilarious. Apparently it stays in Halloween theme for half a year, Nov through Mar, when it becomes “Hostal Ruta del Terror.” How hilarious is that? I felt much better after second breakfast, which, come to think of it, was very fitting for Hobbiton. It was fun to see Estelle again and catch up. She has been kind of walking with Sandra from Germany for a few days. They walk mostly separately, but then meet up in the same town in the evening. I think that sounds fabulous. Monday night is Sandra’s birthday, so they were planning on doing something fun in Leon. I said I was staying at the Parador, and Estelle said Sandra had wanted to stay there, too. If they got a double room, it would be much cheaper per person. I hope they decide to do it. It’s for her birthday! It would be fun if we could meet up in Leon. It’s amazing how much difference a little sun can make. Yesterday I felt like it would rain forever and never stop, and then today it stopped and we had sun, and everything was right with the world again. It would be nice if it didn’t rain tomorrow, either. 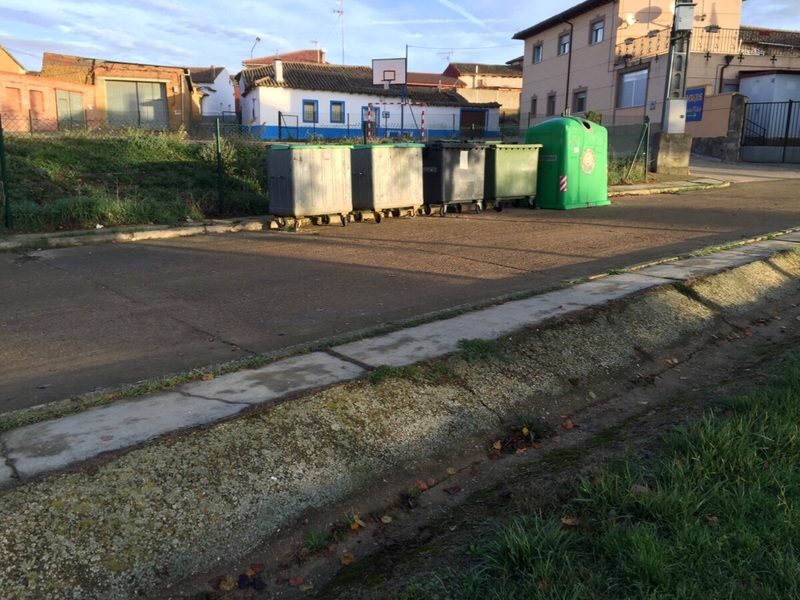 There was a little park outside Sahagun, and Estelle stopped there to wait for Sandra. On the way out of the park I had to pass through some guardian statues, but I proved to be worthy. Their eyes didn’t open even a little bit, and I didn’t have to dodge any laser beams. I must be a good pilgrim. Sahagun is a slightly larger town than some I’ve been through recently, and it even has a train station! I stopped at the office of tourism for a stamp. I was hungry, but it seemed to be a little early for lunch, and I ended up not stopping anywhere. I figured I could get lunch in the next town. I saw Enrique, but we only crossed the street together, and he sat down on a bench to rest for a bit. His back was bothering him again and he was planning to only walk to the next town. I walked to Calzada del Coto, which is where you have to make a decision, to follow the regular camino along the N-120, or go a little north and follow the Calzada Romana, which is a variant. I wanted to do the Roman road, and I figured with the nice day we were having there should be some good pictures. There was nowhere to eat in town. On the way out I saw some benches, and one of them was occupied. It was Peter from Austria, whom I had met a few days earlier in Hontanas. There were so many people at that Albergue. The only thing I had in my bag was cookies, so I had cookies for lunch. We started walking the last 8k to Calzadilla de los Hermanillos. It was nice to walk and talk with Peter. He’s doing the camino in stages. He started from Le Puy in 2013 and went to Cahors. Then he did Cahors to st. Jean, then St. Jean to Burgos, then Leon to Santiago. He skipped over the meseta completely, so he came back to finish Burgos to Leon. Next year he said he will do Geneva to Le Puy. It was also fun to talk to him because it was like talking to the Arnold. It’s such a distinct accent. Today was about 29k ish, but tomorrow should only be 24k, then 20k the next day into Leon. Yay! We checked into a rather expensive casa rural, but the rooms are very nice, and the dinner was excellent. Peter was a little turned off by the commercialism of the place and thought maybe he could eat at the donativo albergue with some other pilgrims, but the Hospitalero of the albergue was coming here for dinner, because he doesn’t cook, so that was out. I actually walked around town with him for a while. His name is Alan and he’s from New York. Estelle and Sandra decided to keep walking and came here! It sounds like they changed their plans and will get into Leon on Sunday like I will, and they will stay two days as well. I had fish soup, which I really shouldn’t have. I should have stayed with the pasta. The main course was pork loin cooked with orange and vegetables, and it was delicious. I even got a second helping. Then dessert was a lemon crema thing with some toasted nuts on top. Very good. Beautiful clouds! That would be a nice day to walk. Those sheep look suspicious about you taking their picture. I hope you’re not too sore from your fall! I banged my leg pretty well on Monday. It’s almost better but I can still feel it. Lovely fog pictures, and I especially enjoyed the picture of the spider web. ☺Ouch. What a fall. Are you OK? “Hobbiton!” How fun. Calzadilla de los Hermanillos is not on my list because you took a slightly different route, so we wrote it in. Apparently Monday you get to Leon? I hope you like it really well. Loved the Hobbiton and lasers. Boo for that mossy ditch. I am sorry about your fall. That must have been scary. I love the sheep pic!